The eCommerce industry is continuing to grow rapidly and is expected to reach at least $27 trillion by 2020. With such a promising future, your eCommerce store requires a robust, scalable, secure, flexible and a highly customizable platform in order to successfully survive in such heated competition. Moreover, the demand to adapt with the latest technological advancements and incorporate them into your online business will decide how meticulously you can deliver exceptional shopping experience. For this reason, the founders of Magento realized the importance of building an eCommerce platform with a futuristic approach. More than 240,000 online stores are powered by Magento and the numbers continue to increase because of the growing demand of online shoppers, globally. Having worked for several eCommerce customers, our expert Magento Certified developers strongly recommend Magento as the ideal eCommerce platform. This is because they have realized that Magento is the only platform that is equally favored by both developers and eCommerce store owners for various reasons. 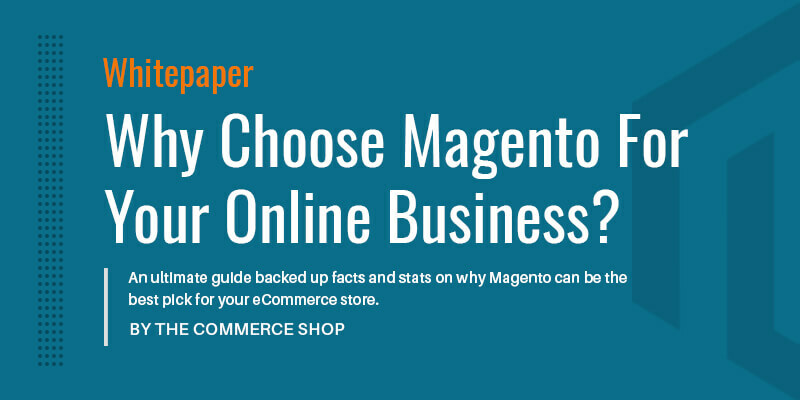 In order to help you understand better and make a smart decision about the future of your eCommerce store, we have documented those reasons in our whitepaper on why Magento is the best pick for your online business. The whitepaper will help eCommerce store owners from SMBs to large scale, to learn about Magento and it’s out of the box features that can be used to drive maximum traffic and increase conversion rates.